Follow President Dan Martin on Twitter @SPUPres. 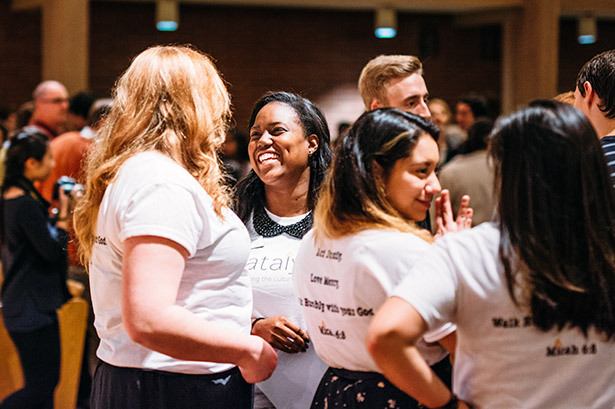 Many campus events are student-planned and led, including Multicultural Night of Worship, sponsored by Catalyst, the Associated Students of Seattle Pacific Intercultural Initiatives leadership group. How do you see students thinking about and using the power of their education? So many students I talk to are drawn to Seattle Pacific University because of the value we place on preparing students for making a difference. Students frequently mention to me that they chose SPU because of our vision to engage the culture and change the world. It is a vision that begins during their time here, as they engage by shaping their own educational experience. Time and again, I have witnessed that if our students have a passion in a specific area and they see a need, they often respond by developing a club, planning an event, or even starting an organization to address it. Since we first hosted Tent City 3 in 2012, students have kept this vital need in front of us, encouraging us to host again. This is certainly an example of the way they’ve used their creative power — they’ve said, we can and we will help address and eradicate homelessness in Seattle. We want to prepare our students for great success in life and for their career aspirations. I want to continue to challenge students to think about what it means to exhibit and use the power they have to make a difference, to live a life of significance. I see our students lean into this concept naturally, and I am confident that they will continue to explore and define how they can use the power of their education in ways that we cannot yet imagine. How has leading SPU shaped your understanding of power? As I consider power, I think there is certainly positional authority in being a university president. However, I think more about the power that the community entrusts in me for my leadership role. I am entrusted with power so that I can fulfill my role and realize our mission. So the question becomes: What can I bring to the University to help us fulfill our mission? I seek to lead in a way that enables me to earn the community’s trust so that I can empower faculty, staff, and students to accomplish all that is before them. The resources I seek to develop could be structural, financial, or bringing clarity as it relates to upcoming initiatives. My role as president is not about me. It’s about our mission. It’s about our students. It’s about the purpose that God has called us to fulfill. The question I keep in front of me is, how am I embodying this role that serves others? That’s how I think about power. One of the ways to accomplish this is by being transparent. Transparency breaks down barriers, so everyone begins to understand how and why decisions are being made. Transparency also allows us to hear from a multitude of perspectives regarding solutions, ideas, or strategies that will enable us to improve our performance and fulfill of our mission. How has this worked within the strategic planning process you’ve recently completed? We want this to be a living, dynamic document we can adapt as we encounter changes, both in the landscape of higher education and even in our physical resources as we acquire buildings. Every step along the way we’ve tried to provide information to the Seattle Pacific University community. Developing that transparency, and then creating a shared vision, leads to a common understanding of where we’re headed as an institution. What parts of the strategic plan are you most excited about? One is certainly the provost initiatives that are integrated within the plan. They are critical for shaping the student experience and for challenging them to grow intellectually, spiritually, and socially. I am also excited about the physical campus development. We’re really at a natural limit for the number of students who we can serve, so the properties that we acquire and the ideas generated from our campus-planning process will provide resources to our campus and enable institutional, professional, and personal growth. Additionally, we plan to take greater advantage of our location in regard to campus and curriculum development. We want to improve vocational opportunities for students, through increased exposure to internships and jobs. There is a vibrant corporate culture here in Seattle at both startups and companies that have been around for generations; our hope is that we can equip students to pursue their calling while developing the skills they need to be successful in their future careers. You chose the theme “Advancing Our Enduring Purpose” for the strategic plan. What does that mean to you? I’m a firm believer that the mission must be kept front and center. Even as we advance as an institution, we do so by keeping our enduring purpose at the center of all we do. The mission and purpose upon which SPU was founded endures today. Our mission statement itself provides the narrative, reason, and impetus for why it must endure and be advanced. It is through students’ curricular and cocurricular experiences that we pursue our mission with the highest standard of excellence and deepest intellectual engagement, simultaneously nurturing and shaping our students’ faith. Our purpose is holistic in nature, constantly seeking to integrate and develop the whole person — intellectually, spiritually, socially, emotionally, professionally, and physically. We enact this mission in the pursuit of our University’s vision: engaging the culture and changing the world. At its core, our University vision is Wesleyan in nature and compels us to work for the greater good, toward human flourishing. That is our enduring purpose.